I picked up this chair on craigslist and I love it! 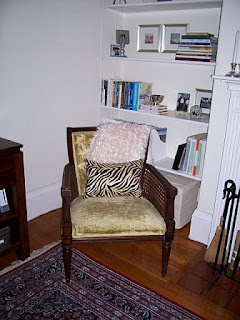 I had been looking for a chair like this for awhile because I saw a picture in domino magazine that I loved and wanted to copy for my place. After searching craigslist for quite some time I finally found it. I can live with the fabric, but the BF hates it. So, I have been searching for just the right fabric to reupholster this chair in. I love the 100% organic cotton fabric from Rubie Green- the problem is I love them all and can't seem to narrow it down to one.